“Maurice was all alone, something had to be done and someone had to do it, I was the only one around so I became that someone.” Those are the simple words of Jack Twyman as he described what he did for Maurice Stokes for twelve years. It wasn’t like they were best friends before the tragic day. It wasn’t like they had alot in common. 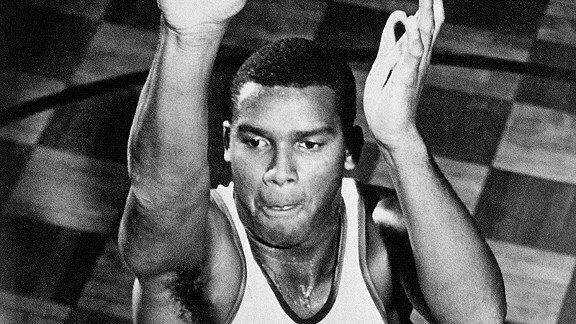 Maurice was a 6’7 240 pound black man who was a power of muscle on the basketball court. Nobody had ever seen his combination of quickness, bulk, and jumping ability! Jack was 6’6 but he was a skinny white guy and his skill was shooting the basketball. They both came into the NBA in 1955. For the first three years in the league everyone knew that Maurice was playing out a Hall of Fame career. He was such a force that he was voted the rookie of the year and later he led the league in rebounding! He was 24 years old and improving every year when the tragedy occurred. It appeared that Maurice had many years of greatness ahead of him! It was the last game of the 1957-58 season and Maurice and Jack’s Cincinnati Royals were playing the Minneapolis Lakers. Maurice was going up for a rebound when his feet got pulled from under him by a Lakers players shoulders. Maurice came down head first on the court and was knocked out. If this incident happened today Maurice would have been sent to the hospital and checked out. Back then though they gave him smelling salts and called him good to go. He actually came back into the game. Two days later after the Royals played the Detroit Pistons in a first round playoff game the team boarded a plane to go back to Cincinnati. Maurice, who was still groggy and sore, had a very underwhelming game for him with 12 points and 15 rebounds. On the plane Maurice became violently sick. He began to perspire heavily and the pilot called ahead to have an ambulance ready when they arrived. When the plane finally landed Maurice was unconcious with a 106 temperature. Maurice was rushed to St. Elizabeth hospital where he slipped into a coma. The next day the Royals were eliminated by the Pistons ending their season. While the other players hurriedly scattered back to their hometowns Jack remained. Cincinnati was his hometown. For that Maurice would be forever thankful! Things were so different in the NBA back then. The average player made ten thousand dollars if that. Maurice being way better than average was making twenty thousand. With Maurice unable to play anymore that salary would be lost. Maurice’s parents Tero and Myrtle didn’t have the means to pay for their sons expensive hospital bills and the hospital was losing their patience. Someone had to act right away to stem the tide. In Jack’s own words, he became that someone. “I became his Guardian”, Jack stated. He had a bank account that nobody could touch. He also had a brand new car that needed to be sold. The final diagnosis for Maurice was Post-Traumatic Encepholopathy. He was paralyzed from the neck down, unable to speak, and stricken to a wheel chair for the rest of his life. He was later transferred to Good Samaritan Hospital where his vigorous rehab therapy would take place. He was able to re-gain use of his hands and was able to learn to speak again years later, though it was hard for people that were not constantly around him to understand. The therapy at the hospital was very expensive. Jack looked down every possible avenue to raise money. Not only were salaries low in 1958 for NBA players but they didn’t have insurance. There was no workmans compensation benefits. Jack hired a lawyer who brought a lawsuit against the NBA and won. In doing so Jack invariably had to risk his own status in the league. Jack was still a player getting paid by the league to play basketball. He didn’t think of himself and his status. He had a single minded goal of raising needed money for Maurice. Still so much more was needed. Jack worked with the NBA Public Relations man Haskell Cohen and Catskills Hotel owner Milton Kutsher to create a benefit game for Maurice. Catskills was a Jewish resort that later became home to very competitive basketball games with stars from colleges competing. Kutsher had the venue and when he heard about Maurice’s plight he wanted to help! The league came together as one to help also. Many of the leagues stars participated in the annual Maurice Stokes game and thousands of dollars were raised every year. Maurice got to a point where he was able to attend some of the games. Maurice took the time to make ash trays for all of the participants! It was a big highlight of Maurice’s year to attend and share his infectious smile and gifts with his long past rivals. The Maurice Stokes benefit game raised over $750,000 over the years but still it wasn’t enough. Jack approached every media outlet in the towns the Royals played in to tell Maurice’s story. Through his efforts donations poured in. 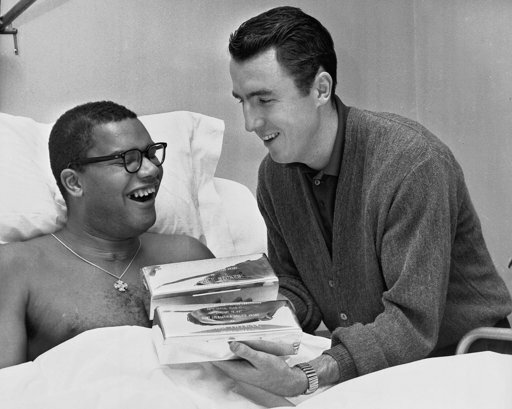 Every Christmas he appeared on Howard Cosell’s radio show to share Maurice’s story again. His story was featured in Sports Illustrated and another $200,000 was generated! Through all of Jack’s efforts Maurice’s expenses were getting paid. Maurice for his part continued the rigorous regiment of rehabilitation that was before him. The results seemed small but Maurice was never discouraged. The hospital actually brought victims of serious crashes and other traumatic experience to Maurice because he could cheer them up with his loving inspired attitude! Sometimes when Jack was feeling down he visited Maurice because Maurice always had a way of putting a smile on Jack’s face! Maurice suffered a massive heart attack in 1970 and died at the young age of 36. Undoubtedly he was strained by his situation and his attempts to keep upbeat in the midst of his troubles. After twelve years the burden on Jack was now removed. He had retired as a player and was working as a game commentator for ABC. In 1983 Jack was inducted into the Naismith NBA Hall of Fame! Later Jack would become a food company executive and made more than three million dollars when he sold the company in 1996! In 1973 a movie was made about Maurice. It didn’t receive great reviews as the critics labeled it as a tragedy displayed with “soap opera effects.” A special viewing was reserved for Tero and Myrtle (Maurice’s parents). After the viewing Tero broke the silence. “It was sad but it was also beautiful”, he said. The Bible speaks about the Good Samaritan. In this case Jack went even beyond the Good Samaritan’s deed. Jack was the Good Samaritan to Maurice for twelve years! Although Jack was extremely successful financially after his NBA career and received the highest NBA honor in the Hall of Fame, his legacy with Maurice will always be his shining glory. Jack was always humble about the experience saying “anybody would have done it.” I’m sure it was Jack that was placed there because his other teammates wouldn’t have. There were a couple of other issues not mentioned. Jack was white and Maurice was black. Back in 1958 racial opinions were far different. Jack never let the opinions of others get in his way of helping Maurice! The other factor was Jack’s family. He had a growing family at the time of the accident. There was a time when Jack questioned whether he was neglecting his own family. His family proved to be very understanding though and Maurice became a part of them too! One of the happiest days for Jack was when Maurice got named to the Hall of Fame in 2004 and Jack accepted the award on his behalf! After playing only three years in the league such an honor was unheard of. Yet because of the very special circumstances Maurice will forever have a plaque in the Hall of Fame for all who visit to see! Jack Twyman died last year at the age of 78. In his and Maurice’s honor this year the NBA has named a new award. It is called the Twyman-Stokes Teammate Of The Year Award. 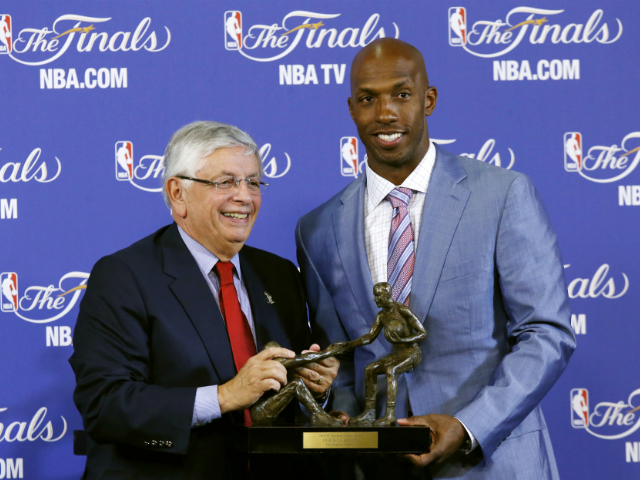 The first winner of the award was Chauncey Billups. The award has a sculpture of Twyman helping up Stokes his fallen teammate. After finding out that he won the award Chauncey did some research of Twyman and Stokes. Chauncey was amazed at the story and the dedication involved. He considered himself a good teammate but he was very humbled to be mentioned in the same breath as what Jack Twyman contributed. When Maurice had undergone so many hours and years of rehabilitation he was finally able to use his hands. It was decided that maybe a typewriter would be a good gift for him! Studiously and slowly he typed out a message. It was the first thing that he typed on that typewriter and it was the most memorable! He typed out a letter to his friend Jack. The text was this: “Dear Jack, How can I ever thank you?” It reminds me of a question we should all ask Jesus for dying for our sins. The answer of course is you can’t, but accept this gift because I love you! Posted in Christianity and Sports, Compassion, Is there a Doctor in the house? Wonderful, heart warming story! It shows eloquently how people can rise to the occasion and accomplish so much!! Lewis, thank you for sharing this beautiful story. Jack not only displayed the love & compassion of the Good Samaritan in Jesus’ Parable; in laying all of his own interests down to help his broken friend, he truly embodied the selfless love of our Lord Jesus Christ. You are an excellent writer! You never fail to inspire me with the beautiful messages God gives you to share on your blog! God bless you, my friend!